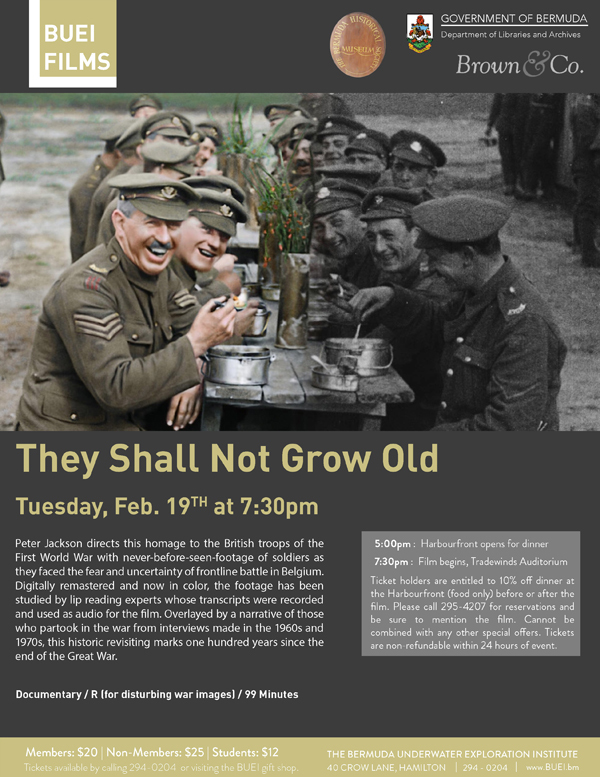 The Bermuda Underwater Exploration Institute [BUEI] will present a screening of “They Shall Not Grow Old” on Tuesday, February 19 at 7.30pm in the Tradewinds Theatre at BUEI. The event poster says, “Peter Jackson directs this homage to the British troops of the First World War with never-before-seen-footage of soldiers as they faced the fear and uncertainty of frontline battle in Belgium. “Digitally remastered and now in color, the footage has been studied by lip reading experts whose transcripts were recorded and used as audio for the film. “Overlayed by a narrative of those who partook in the war from interviews made in the 1960s and 1970s, this historic revisiting marks one hundred years since the end of the Great War. Tickets cost $20 for members, $25 for non-members and $12 for students, and are available by calling 294-0204 or visiting BUEI’s Oceans Gift Shop.